This Caramel Honey flavored coffee is perfectly for those who want extra sweetness to jump-start their morning. 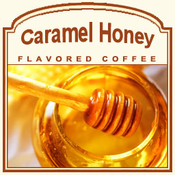 With a creamy, caramel undertone, this Caramel Honey coffee also features a scrumptious hint of honey � making it melt-in-your-mouth all the more with its velvety texture and natural honey comb flavoring. Spoil your senses with this 2-calorie cup of Caramel Honey coffee and it's wholesomely gourmet flavor from the 100% authentic Arabica beans made to roast this delicious flavored treat. Sent in a heat-sealed valve bag, your Caramel Honey flavored coffee will be fresh and of the highest quality from the first brew to the very last. Since this coffee will be roasted and shipped on the same day, you can expect your creamy Caramel Honey to taste decadently rich � like it was swirled together just for you. Go ahead and indulge in this sweet treat!